Wes Welker is an unlikely star wide receiver in the NFL. He is not blessed with considerable size or speed, which is normally a prerequisite for the NFL. However, he has developed a reputation as a security blanket for elite quarterbacks, based on his ability to get open and his dependability. His speciality is catching short passes and lots of them. While he will never be a great investment because his natural ability is limited and he is considered a niche player, Welker has considerable respect in the league and hobby and his cards remain a popular option for collectors. Although Wes Welker put up big numbers in high school, college offers were not rolling in for the 5'9" athlete. A last-second offer from Texas Tech came about because a recruit backed out on his scholarship, opening a spot for Welker. 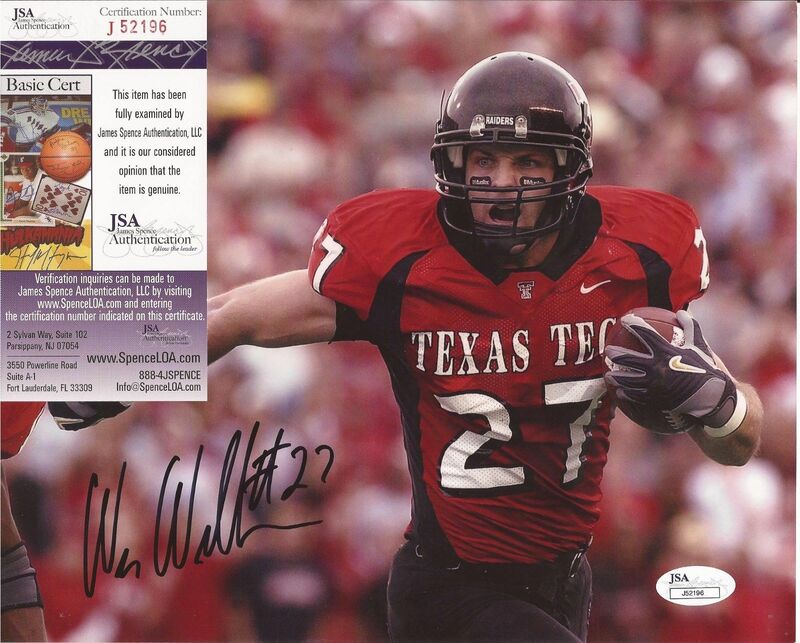 Welker would go on to put up huge numbers at Texas Tech, and was known for his big catches and abilities as a punt returner. Despite this college success, Welker was not selected in the 2004 NFL Draft. Wes Welker joined the San Diego Chargers training camp and made the final roster as an undrafted free agent. However, he was cut after the first game. After going through waivers, Welker signed with the Miami Dolphins as a backup wide receiver and special teams player. He slowly worked his way up the roster and was the top producing wide receiver on the team during the 2006 season. In 2007, it was revealed that the New England Patriots were interested in Welker and they soon worked out a trade with the Dolphins. New England was Wes Welker's breakout period. He immediately developed a strong rapport with quarterback, Tom Brady, and caught over 110 passes in five of the six seasons he was with the team. 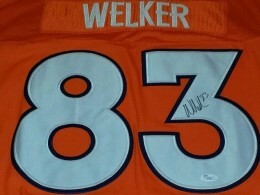 Welker was also named to five straight Pro Bowls during his time there. Although he was a vital part of the offense and a favorite of Tom Brady, the team could not reach an agreement with Welker once he became a free agent. He accepted a contract offer with the Denver Broncos, joining another future Hall of Fame quarterback, Peyton Manning. As Wes Welker pushes further into his thirties, a regression is inevitable. Plus, the Broncos already feature a stable of talented receivers, so there may not be enough passes to go around. Despite this, Welker has been doubted his entire career, and injuries are the only thing that has slowed him down so far. With Manning at the helm, the Broncos are among the favorites for the Super Bowl and Welker figures to be a key part of that possibility. 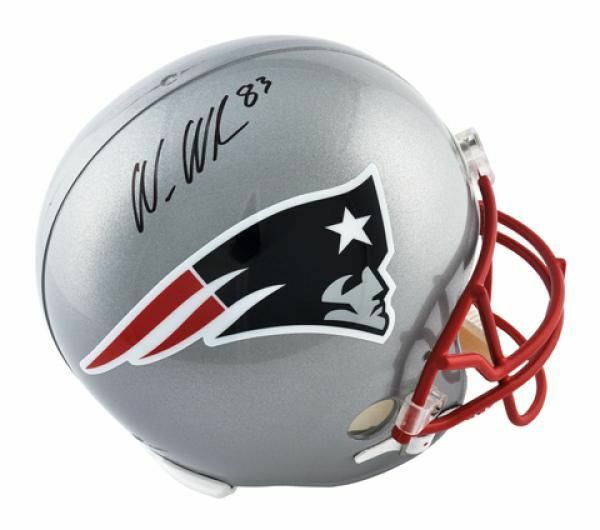 An NFL Championship would provide a boost to Wes Welker cards, as he never won a Super Bowl in New England. 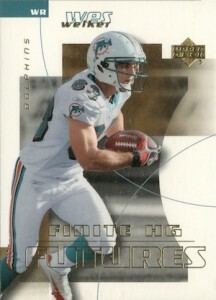 Since Wes Welker went undrafted, there are not a lot of rookie cards for the veteran receiver. With only 11 total cards and one autographed option, picking his top rookie is a simple decision. 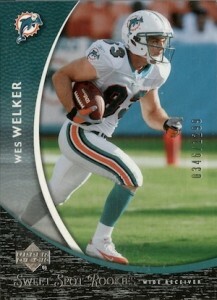 When it come to Wes Welker cards, there is one clear favorite. 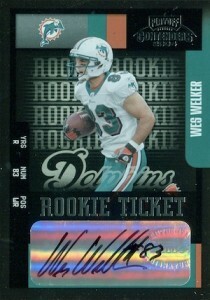 The popular Contenders product was the only rookie option for Welker to include a signature and it remains his most valuable rookie card. Although the print run was not released, it has been selling well. WES WELKER 2013 SPECTRA BLUE MATERIALS JUMBO JERSEY PATCH 25 25! LAST ONE MADE!! Below you will find an example of what Wes Welker's authentic signature looks like. This can be used as a first point of reference for determining the legitimacy of autograph memorabilia, but is not a substitute for having your items authenticated by a well respected professional autograph authentication company. Some of the trusted sources within the sports memorabilia market include the following companies: PSA, JSA, Tristar, and Mounted Memories. Russell Wilson also has his own authentication hologram stickers. Click on any of the images below to view full size photos. 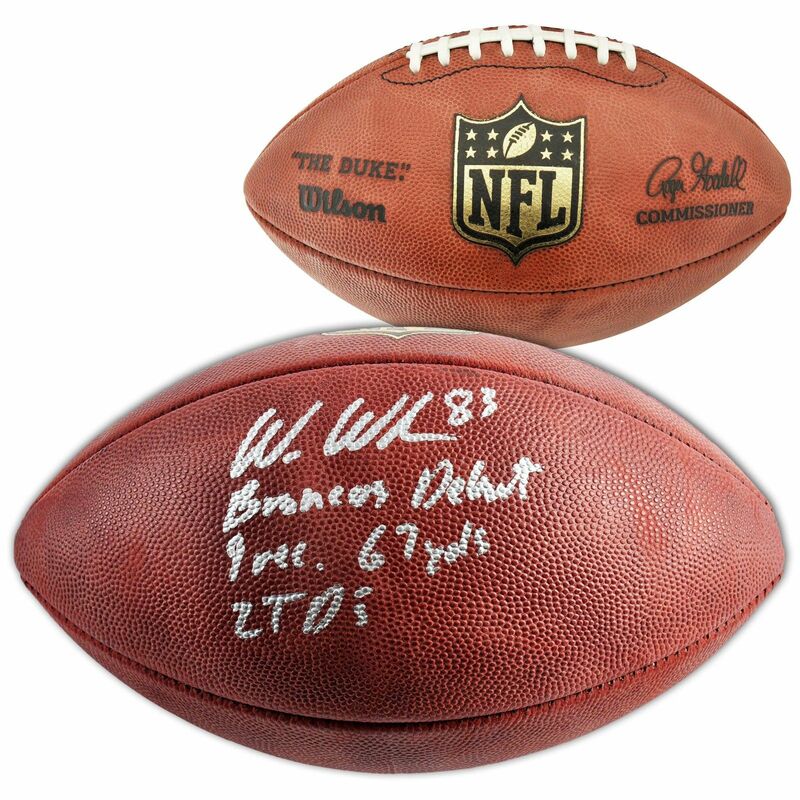 The letters "e-r" are implied with a slight rise and extension of a horizontal line coming off of the "k"
WES WELKER Signed BRONCOS 8x10 Photo - JSA COA GORGEOUS!